We all see the value in combining social and biomedical data collection, so let’s ensure we can do it effectively. Home > Blogs > We all see the value in combining social and biomedical data collection, so let’s ensure we can do it effectively. Collecting objective measurements of health, often referred to as ‘biomeasures’, is now an important feature of many of the UK’s longitudinal studies. Some examples of measurements that are now taken include assessments of physical and sensory function and the collection of blood and other biological samples. Capturing these kinds of measurements enables researchers to discover things that cannot be captured through survey questions alone, assess health with greater accuracy and therefore deepen our understanding of the interplay between social and biological factors in explaining human behaviour. However, to establish the number of clinics that would be required to meet the needs of large scale studies, like the national birth cohorts, would be extremely difficult and costly. Studies with a social science focus such as these typically sub-contract data collection to an external fieldwork agency and both the study teams and the agencies generally lack the expertise to run clinics. As such most national studies, especially those with a social science focus have relied on home visits for the collection of biomeasures. A common alternative approach is a two-stage model in which participants first meet with an interviewer and are then visited by a nurse who takes the biomeasures. However, the use of two data collectors is costly and there will inevitably be some drop off between the interview and the nurse visit. To increase efficiency the most recent sweep of the 1970 British Birth Cohort (BCS70) initially, but unsuccessfully, trialled using nurses to conduct interviews and collect biomeasures in one visit. Interviewers are used to the need to make repeat visits, including to those individuals who are initially reluctant to participate. But, many nurses did not like working in this way and opted not to continue working on the project. Therefore, for the second half of fieldwork, BCS70 reverted to the ‘two-stage’ approach using interviewers and nurses, which was far more successful. This approach will be used in the forthcoming follow-up of the National Child Development Study (NCDS) which will also feature a significant biomedical element. Training interviewers to collect biomeasures can also increase efficiency. For example, fieldwork agency interviewers working on the Millennium Cohort Study were trained to conduct physical measurements and collect saliva. Other studies use interviewers to collect measures, including grip strength and lung function. There are, however, no precedents as yet for training interviewers to collect intravenous blood samples. At present, if blood samples are required − as they typically are, because of the huge range of biomarkers they contain − then an interviewer-led approach would still require an additional visit from another person able to take blood. Another cost-effective approach is to ask respondents to collect biomeasures themselves. Saliva has been collected by participants in the National Survey of Health & Development and Whitehall II study, while ALSPAC participants have posted breast milk. This is an attractive approach, but more research is required to understand how respondent-led collection of biomeasures might affect response rates, data quality and cost; something that will be looked at closely in Understanding Society’s forthcoming Health Innovation Panel. Clearly, given there is more and more demand for biomedical data, increasing the capacity of agencies to collect biomeasures will help us to realise the potential of combining social and biomedical data collection. 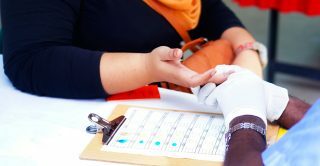 But, whether it is the nurse asking the questions, the interviewer conducting measurements, or even the participant collecting their own samples, each approach has advantages and disadvantages. No single approach will be optimal for all studies. A CLOSER workshop brought together longitudinal study teams from medical and social science backgrounds to share experiences about what has worked well and less well. This was an enormously useful event, as unlocking the huge research potential of combined social and biomedical data will require much more collaboration and interdisciplinary working of this type.